Eolo Lodge - Patagonian bliss. Photo copyright mine. Earth's secret paradise: Our armchair world tour continues and this week's destination was Patagonia. We visited Patagonia some years ago as part of a trip to Argentina. We stayed at the delightful Eolo Lodge and would recommend it to anyone looking to get away from it all and see some amazing scenery. Admittedly, during our 3 days, we only scratched the surface of this incredibly diverse region, so we accompanied our virtual date with some TV-based research. I recommend this 3 part series from the BBC which will help you get a feel for the place. Comahue Pinot Noir (2013) from Marks and Spencer accompanied our attempt at a local dish: venison with red wine sauce, mash and veg. Patagonia is famous for lamb, but that's often cooked in a fire pit. Not something that was open to us in the week leading up to Christmas (yes, this blog post is being published a little behind schedule). Regular readers will know that Mr Purple Teeth is not the hugest fan of Pinot Noir, and on opening this one, I feared the worst. It was relatively pale red, and light and bright rather than deep and dark. It looked really appealing to me in my Riedel stemless Pinot Noir glasses. Marks and Spencer are proving a useful high street store for our virtual travel dates. The range of countries covered is far greater than any of the other supermarkets, and all the wines we've had so far have been a hit with Mr Purple Teeth. That's no mean feat. He was quite happy with this one, and enjoyed it's smooth out feel and black cherry fruit expression. The wine matched really well with our venison dish. It had a good medium body and some fruits of the forest notes along with some spicy notes from it's French oak ageing. Relatively simple, it was nicely juicy, coming from some of Argentina's most southern vineyards. What marked this wine out was it's versatility. It was the week before Christmas and the house was full of cheese. An impromptu dessert of vintage Cheddar, Gruyere, Epoisses and Gorgonzola Picante was served. The wine paired successfully with all of these cheeses, many of which struggle with a lot of red wines. This will be it's main selling point when we're not armchair travelling and watching BBC documentaries on the region. Where does the time go, at this time of year? With so much going, it can be hard to find time for each other. So Mr Purple Teeth and I decided to start a new idea. Virtual "armchair travel" dates. We randomly pick a hemisphere, lat and longitude, and find somewhere on the map that's nearby and looks worthy of a "little trip". For a wine-enthusiast, it was a lucky break to find our first location was Oregon USA. Oregon's food culture is simple: sustainable, local, seasonal, with a dash of Pacific Northwest game, and Asian fusion influences. As for the wine, the area is gaining a great reputation for quality Pinot Noir. And while the wine's are not exactly priced for midweek, nor available in a giant supermarket near you, it is getting easier to get hold of them. With an "Oregon-inspired" backdrop of music by Pink Martini, Elliot Smith, the Decemberists and Josh Garrells, we started with a little discussion of what we had found out about the area from our online studies, and were surprised to find that recreational cannabis use has been legalised. We decided not to try to bring this element of Oregon life into our living room. Instead, we started with a Pinot Gris, sourced at £13 from Marks and Spencer. Boasting "Willamette Valley Grown" on the label, the grapes must have been vinified elsewhere. Willamette is one of several AVA (American Viticultural Areas - a similar regulatory system to Europe's protected designations of origin, like DOC), in Oregon. You might also look for Umpqua Valley, Walla Walla (which sounded more Australian to me), Rogue Valley or Columbia Gorge. There are several others, but, Willamette is the one I've seen most of in the UK. 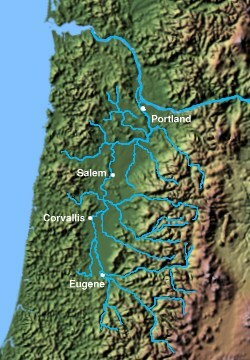 "Wpdms shdrlfi020l willamette valley". Licensed under CC BY-SA 3.0 via Commons. With a delightful nose of honeyed peach and hint of floral, that seemed a nod to Alsace styles, I was initially hopeful. In fact it was bright and powerful - the scent leapt out of the glass. Following through on the palate, there was honeydew melon, ripe peach, a rich and full body. Nothing like Pinot Grigio! Relief. It's oily texture and silky feel was reminiscent of the French styles and though it's dry, it's so rich that you could think it "sweet because of the fruitiness", as Mr Purple Teeth highlighted. Mr Purple Teeth loved it. "Big flavours, ripe melon and peach a seems a bit sweet - I love it!" I didn't investigate the provenance of the sea bass, but cooked in an Asian style with chilli and pak choi, it made an exotic but simple appetiser. The wine's label had also indicated chilli and lime chicken as a suitable food partner along with Asian style cooking. Powerful enough to stand up to the robust flavours of the dish, the wine was a success. I will certainly be buying it again. In a world where the decent independent wine merchants are disappearing from our high streets as fast at the butcher and the grocer, Marks and Spencer do seem to be offering something a little different from most of the supermarkets. With a decent selection from less commercial regions, they make finding something a bit different, just a little easier for those of us who don't have a fantastic wine shop nearby. Not everyone wants to stock up in bulk on-line. ​At 14.2%, and with a very full body and richer, darker colour than many French or New World Pinots, I was hopeful that it would pass the test. I have noted that Mr Purple Teeth likes a full body (lucky for me, eh?!). Like the Pinot Gris, this had a powerful nose, with the bouquet leaping from the glass at the first pour. Wild strawberry and an almost Rioja-like vanilla from American oak were very pronounced. Following through, a great sensory mouth-feel from fine-grained, smooth tannins, juicy acidity and that full body, at last, a Pinot Noir that had the potential for Mr Purple Teeth to enjoy it. How would it pair with the dish I had planned? I had decided to cook some local British venison steaks, with seasonal flower sprouts as my nod to Oregon cuisine. With a preference for redcurrant or fruity, or even chocolate sauces with my venison, I was concerned that these may overpower a nice Pinot Noir. So, continuing the fusion theme, I opted for a hint of sweetness with a Teriyaki sauce with sesame. While this is hardly "Fat Duck" level creativity, for someone who claims not to cook, I was quite impressed with this. The sweetness was great with the iron-rich game and greens, and the umami from the soy played nicely with the wine. It was a gamble that paid off. The greens too, played their part, and didn't clash. (I also enjoyed the wine with a strong cheddar the night after our "day-trip to Oregon"). While it won't replace Gevrey-Chambertin as Mr Purple Teeth's Pinot of choice, he enjoyed it. He also said that this was the best venison he'd had in a long time - including from several very good restaurants. While it may have been the Pinots talking, I'm taking that. Oregon's wines and food culture inspired us both, and the idea of "virtual" travel will be something we continue with while we save up enough for our next "trip of a lifetime". Oregon wine country is well established for oenotourism, and while not as well known as Napa or Sonoma, I hope that I'll one day be able to visit it for real. We finished off the evening by getting a further insight into Oregon culture with an episode of Portlandia (see below). £30 for wine might seem a lot for a Wednesday night, but compared with a couple of substandard glasses down the local, or a transatlantic flight, I think we got a bargain. I've had "Bull's Blood of Eger" several times before (Egri Bikavér), and indeed, I've been lucky enough to try several Hungarian wines. I was given this bottle in Budapest, by a Hungarian friend, back in January, with the comment, "it's nothing fancy". Looking at the label, and with the warning, I didn't expect this to be particularly special. It's a funny name for a wine, "Bull's Blood". The wine was given the name due to a widespread belief that bull's blood was indeed a secret ingredient in the wine, giving the strength to defeat the invading Ottoman Turks back in 1522. In 1997, Hungary's first Districtus Hungaricus Controllatus - DHC was created (similar to the French Appellation d'Origine Controllée (AOC) for Eger and it's bull's blood wines. ​It's a dignified and historic wine. However, I was unable to find out anything specific about this particular bottle except that it was vintage 2012. Usually Kardaka and/or Kekfrankos make up a big part of most Bikavér wines, but there was no blend information on the label - my Hungarian skills left me not even knowing what the brand/who the winemaker was. What I could figure out was that it was a decent bottle. A beautiful smooth texture, medium to full bodied, with a lot of ripe tannin, smokey dark fruit flavours, a hint of violet and a lot of spice coming from oak. It tasted a lot better that I had given it credit for based on the label. I'd pictured a hasty 5€ purchase, that was perhaps okay for a Monday night wine. I'd fallen into the trap of judging a book by its cover, a wine by it's label. Many of us, with little else to go on, will choose our wine hastily because we "like the look" of it. And getting the branding right to appeal to the market is an art. I've seen some hilarious mistakes, or is it genius - you decide. See below. I'd love to hear about your wine successes and failures based on "buying on the label". Back to our wine... Egri Bikavér must contain at least three of the following 13 grapes: Kadarka, Kékfrankos, Blauer Portugieser (Kékoportó), Cabernet Sauvignon, Cabernet Franc, Merlot, Menoire, Pinot noir, Syrah, Turán, Bíborkadarka and the modern Austrian crossings, Blauburger and Zweigelt. Grapes are usually vinified separately with blends receiving 6 months oak barrel ageing and 6 months in bottle before release. The "Superior" level Bikavér must contain 5 varietals and has twice as long in oak and bottle before release. It's complicated. In a world where grape varieties are becoming short hand for brands, is tough to communicate about wines like this. Consistency is another challenge with so many varietals to choose from. But there are big brand blends out there, and blending based on vintage and local conditions, is a long understood tradition in many top quality areas, like Bordeaux. While Bull's Blood was once a huge success in the UK it's actually not that easy to get hold of now, outside of specialist retailers such as the Hungarian Wine Society and the Hungarian Wine House. In fact, even specialist wine merchants often only have the delicious sweet Tokaji wines in stock, while supermarkets may not even have that. Perhaps because it's a hard wine to understand with so much possible variation, perhaps because of the success of New World wines since the 1980s, perhaps it was just seen as too 1970s. It's a pity as its a wine with great character, a cool back story and at a reasonable price point. If you do see Bull's Blood, make sure it's Eger (Egri) to get the authentic experience. Fans of spicy, dry reds should enjoy it. Why not visit Budapest and try some there? PS - I'd love to hear your good and bad experiences of buying wine based on the label - feel free to email me, or contact me via my Facebook or Twitter. Disappointed! This wine could have been so much more, but it had a bit of a fault. That is, a bit of secondary fermentation in the bottle giving in unpleasant spritz to the wine. Tannat is the signature grape of Uruguay and also of Madiran in France. It's also renowned as having one of the highest levels of reservatrol - the compound that's making headlines for red wine's health benefits. I was keen to try it. This example from Argentina is a bottle that's been on my wine rack for around a year - the last time I bought anything from Naked Wines. It's no longer in stock. Pity, I'd love to have tasted a non-faulty bottle. Deep purple berry flavours, freshness, smooth but hefty tannin - it's everything Mr Purple Teeth loves with his Tuesday night cheeseboard. But. It's faulty. There's a lot more faulty wine out there than we appreciate. I found a number during the IWC associate judging I did a couple of weeks ago. Many of these faults go unrecognised by us punters. We just drink the wine and say it's no good. We shouldn't! Facts can be avoided and should be reported. Meanwhile, I'll be looking for a Tannat from Madiran or Uruguay to find out exactly how good it can be. Tasting beyond the fault, this could have been amazing. Let me know if you had one!